Shenton Bushland Activities: Chasing the dog! I came across a dog in the bushland on Sunday - looked like a Jack Russell - white with brown patches - ran off before I could take a photo. Not sure whether it was with a person - will need to keep a look out. Continued on with weeding freesias - which are very easy to find at present. Did a walk around the path and found more freesias along the southern path - will concentrate on that area next week. The bushland appears to be continuing regnerating 2 months after the hail storm. 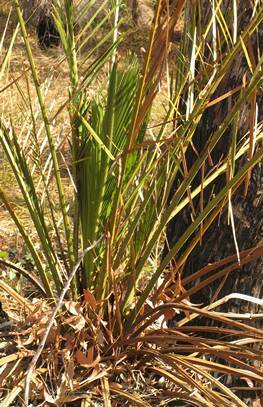 The Zamias have an actively growing core to replace the damaged outer fronds. The alocasuarinas which were very badly hit in the storm (lost virtually all of their leaves) are now producing epicormic growth. You can see the damaged bark on the stems. 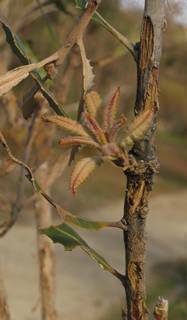 The banksias are likewise producing epicormic buds to replace the damaged foliage. Note the damaged stems. The Jarrahs have been most prolific in regnerating and rebuilding their canopy.